Now that we’re looking at images, it’s important to understand the basics of what you can and can’t use online. This post won’t/can’t cover it all (governments are grappling with the complexities of online copyright as we speak! ), but we’ll look at Creative Commons and how it frees us to share and reuse online. Creative Commons is a nonprofit organisation that offers a simple, standardized way to give public permission to share and/or use your creative work. CC licenses offer various levels of permissions, from ‘all rights reserved’ to ‘some rights reserved’. CC licenses are now commonly found on photos, blogs (including this blog), published material, teaching resources, music and more. Take a look at the types of licenses available on the CC license page. Think about whether any of these might be appropriate for any of your work. You can search media sources, particularly Flickr, for CC-licensed images. On Flickr, you can go directly via the Creative Commons Flickr page. If you’re interested in looking beyond Flickr, try the Creative Commons Search Page, which allows you to search for CC-licensed content on Wikimedia, Google Images, Europeana, YouTube, SoundCloud and more. Explore Open Spires to see types of Open Educational Rerouces (OERs) are available online. If you’ve uploaded images on Flickr, go through the steps of adding a Creative Commons license (you don’t have to retain it or go to the final step if you don’t want to). Consider adding a Creative Commons license to your blog or another piece of online work by using the ‘Choose a license’ page. If you’re interested in copyright online beyond the basic CC licenses, you can explore endlessly. You might also explore issues related to open access, particularly in scholarly communication. For some interesting places to start, take a look at the presentations from the 2013 Open Access Week in Oxford. We wanted to talk about CC license before you wrote a blog post, because we’d like you to find an appropriately licensed image from Flickr (or another media site) that you can include in your post. Make sure it allows sharing! If you’re logged into Flickr, you can use the ‘Share’ button to grab the photo for your blog directly. Otherwise, you can either download and then upload to your blog, or grab the html or link for embedding. Nottingham Uni offers a great attribution tool called xpert that allows you to embed the attribution in the image. Once you’ve uploaded a photo to your post (with the proper attribution if necessary), write about your experiences with images sharing tools and copyright online. Would you upload your own photos? Would you use photo sharing sites professionally? 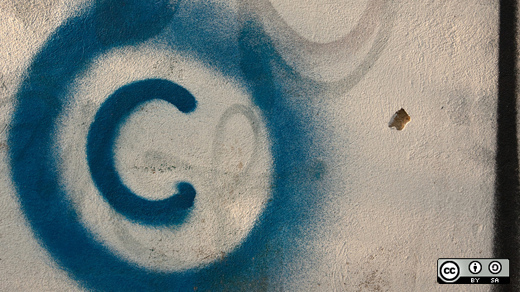 Would you consider Creative Commons licenses for any work you have created? Tag your post Thing 17 and Thing 18. This entry was posted in Thing 17 by Alasdair Watson. Bookmark the permalink.